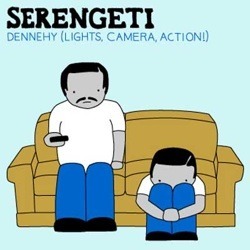 Scoring high in the area of concept records, Serengeti's Dennehy is unflinching in its frank depiction of adolescence, strained relationships, and class differences. Set in Chicago, the title track introduces us to Kenny, by far the most memorable character on the album. Serengeti's Chi-Town accent is surprisingly dead-on as Kenny raps about his love for his hometown teams: “Bears, Hawks, Sox, Bulls…” Meanwhile, a loner kid wears his emo heart on his sleeve, accurately depicted in the self-deprecating lyrics of “I Don't Know” and the string of bad luck that unfolds in “Lights, Camera, Action”. Rhymes from the wrong side of the tracks cross over on “Caucs”, as aspiring MCs spit daggers for verses and glare in the face of gentrification and unfair distribution of wealth. Even in the midst of such dour subjects, Kenny remains a constant source of humor. Unveiling first-hand accounts of his everyday life, reminiscing about his “Weber Grill”, “New Dodge”, or singing pangs of undying love for his wife (“Julie and Me”), you'd be hard-pressed to find another character quite like him. Justice has been served with the re-release of this album, one that should earn Serengeti folk hero status within hip-hop's underground a la M.F. Doom.